Happily, Dan released a new version specific for the iPad. 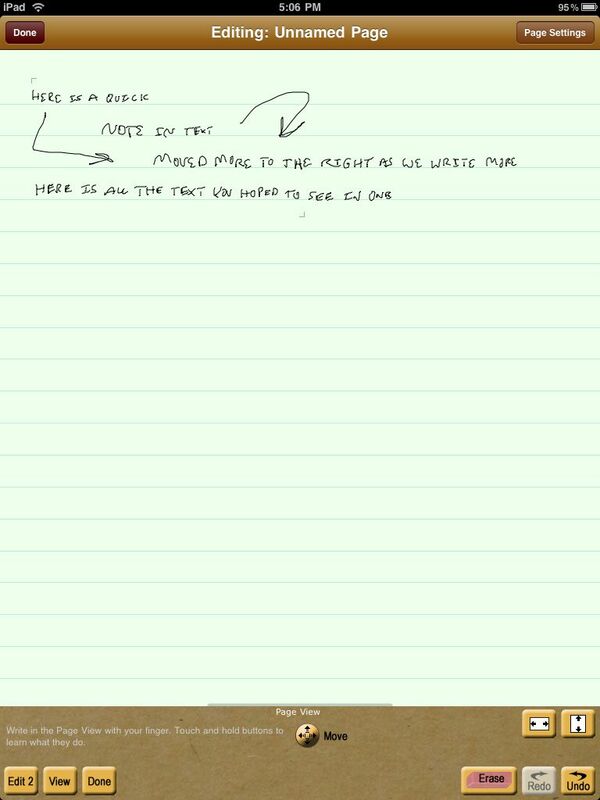 Right off, what we love about Note Taker for the iPad is that you are writing in full size and the app shrinks it down to the right size for the 8.2 x 11 page your entering text on. 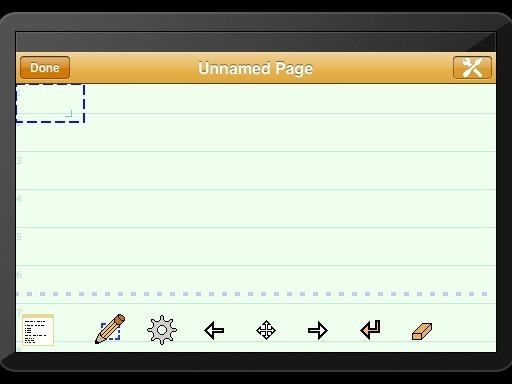 And, the ability to jump from writing text to drawing arrows and lines around that text. You can choose where you want the text to start, allowing you to create text blocks that you can tie together with lines – like what we are all used to do with our pen and paper days. A true hallway note taking solution! In the image above, we have the screen set to allow us to write in the lower box and it appears in the upper area. Since the app isn’t trying to redraw the whole page as you move your finger through the letters of a word, the text entry is very fast. You can set the text entry box to auto move from right to left as you write or as it is set here you tap the ‘Advance’ button when near the end of the line. You can still see what the last letter(s) you wrote to you can continue writing and the text lines up end to end. Most folks in the office are much cleaner in their handwriting on the iPad so their lettering looks just like it does with a pen and paper. You do not need to learn another alphabet for the letter entry or how you draw your letters to look right. The learning curve is to stop thinking about writing and just write. The button in the lower left corner moves from Edit 1 to Edit 2. 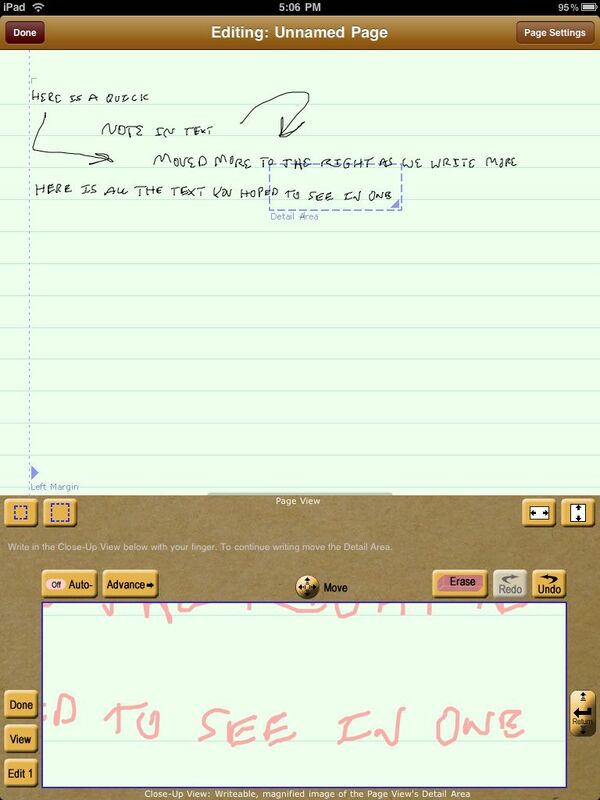 Edit one is the view you put the page in to write and draw directly on the electronic page. Edit 2 is for the above handwriting. Erasing, undo and redo is also just a button tap away. There is a included ‘help’ file as well you can tap and hold on any button in Note Taker to see ‘help info’ for that particular button. After your done, you have access to a thumbnail view of each of your documents along with name and date connected. You can go back and edit or add to any of your documents at anytime. 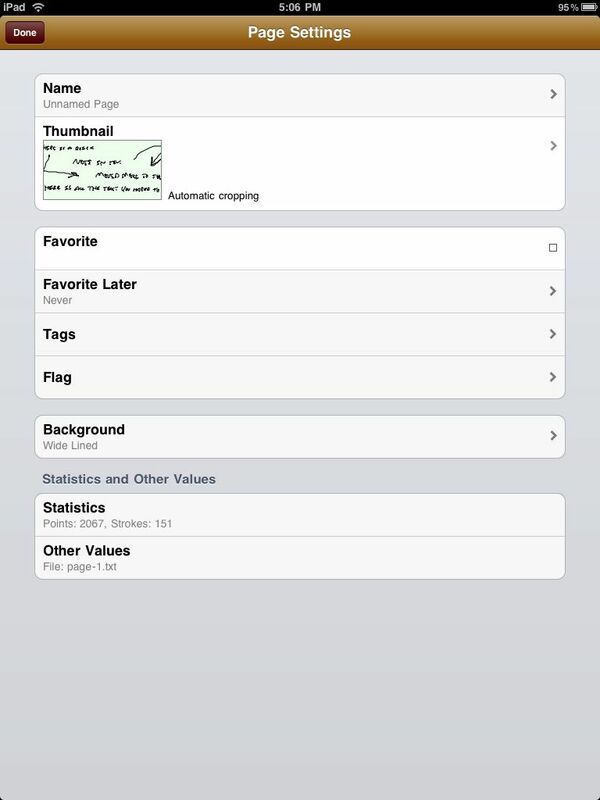 Tagging helps find documents dealing with particular topics later. We usually tag with names of people the meeting involved or the project the notes will reference. Flagging is also supported. Tuning is available at the individual page level. Adjust to your style or like we do, we adjust the background to match the data type in the note: Narrow Lines, Wide Lined, Narrow Grid, Wide Grid, Wide Lined With Not Title Area and finally, a clean blank white page. 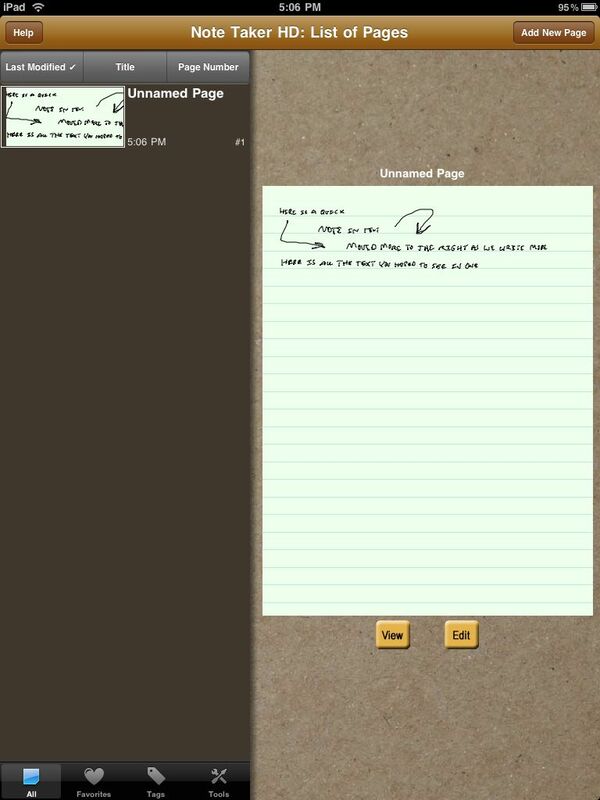 Share your notes with others via emailing, either one note or all in the list your viewing.